Apple wants to position its new entry level 2018 iPad as an education-focused tablet, but given the cemented position more affordable Chromebooks and Windows devices have in educational institutions across North America — especially in often cash-strapped Canadian public school boards — it’s unlikely this will happen at a vast number of educational institutions. It’s possible some schools could purchase a lower number iPads for a multi-classroom A/V cart of some sort, but Apple’s one-iPad-for-every-student ‘Schoolwork’ strategy won’t be a realistic option for every Canadian school. That said, Apple says that there are a variety of schools across Canada with varying levels of funding already using iPads on a 1:1 student-to-device ratio. The price issue is exemplified because schools will also need to purchase the $129 Apple Pencil, a case and a Bluetooth keyboard (more on this later), on top of the $399 ‘education-priced’ tablet. Logitech is also selling a $49 USD ‘Crayon’ stylus exclusively to schools. Despite the iPad being an arguably more capable device when compared to the average Chromebook, for the tablet to be a legitimate education market contender, Apple needed to hit a significantly lower price point. When the company’s education event was first announced, I envisioned a durable all-plastic, low-end Chromebook competitor destined for a $250 — or possibly even lower — price tag. This theoretical tablet wouldn’t be sold to regular consumers and instead could only be purchased by education institutions, similar to Apple’s early 2000s eMac. That’s not what the new iPad is, unfortunately. That said, despite not amounting to the education tablet Apple is aiming for, the 2018 iPad remains the most capable under-$500 tablet out there. 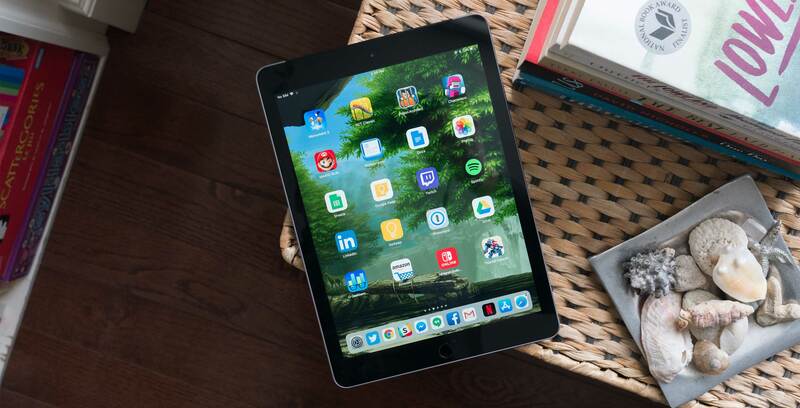 It’s been a long time since Apple has released a less than stellar tablet, with last year’s sixth-generation 10.5-inch iPad Pro leapfrogging the competition in almost every category — especially after the release of iOS 11. 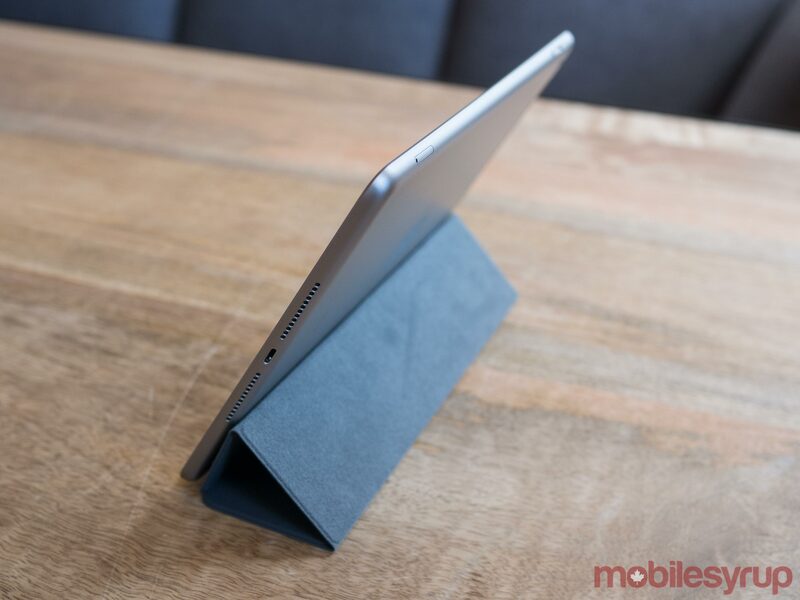 This year’s base level iPad nixes most of the Pro’s more premium features, including Apple’s magnetic Smart Keyboard connector, its beautiful laminate display with True Tone ambient light matching, and even a modern camera. 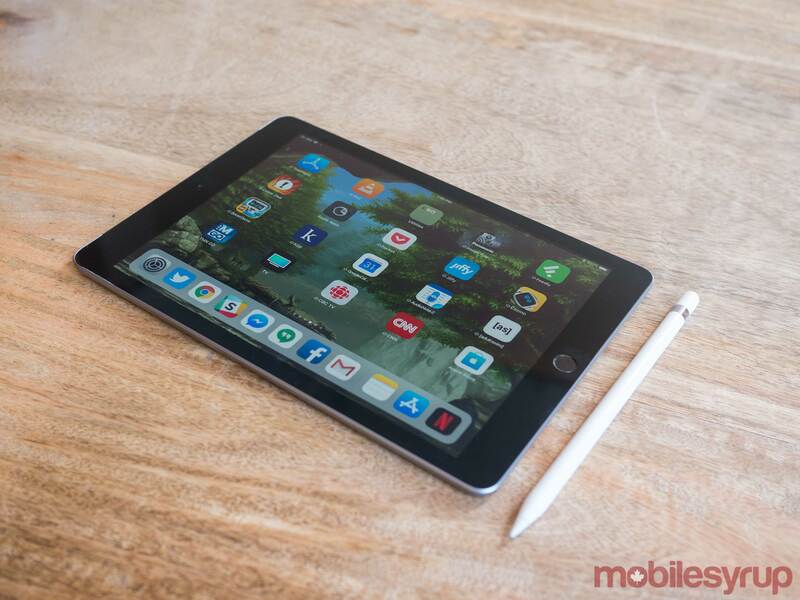 The 9.7-inch 2018 iPad is Apple’s best all-around tablet ever when its $429 CAD starting price — a $20 drop over last year’s $449 iPad — cost is taken into consideration. 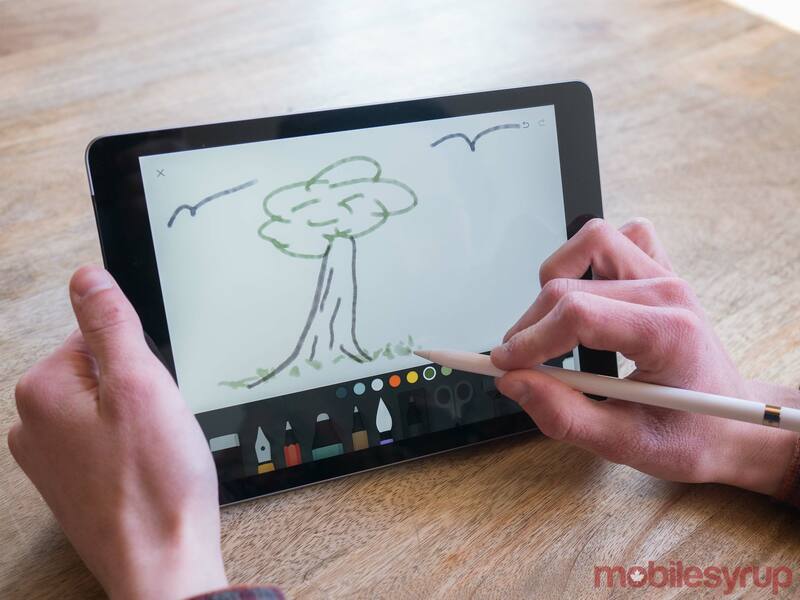 Along with the expected yearly processor bump, Apple has also added Pencil support to the 2018 iPad, a fact the Cupertino, California-based tech giant placed significant emphasis on during the tablet’s theatrical reveal at U.S. high school late last month. I’ve never had much use for the Apple Pencil given my inability to even sketch a basic stick person, but I’ve spoken to creators across a variety fields who claim that Apple’s stylus is more technically sound and offers a more tactile feel than Microsoft’s Surface stylus. I’ve spent a little over a week with the iPad at this point and I can report that using the Apple Pencil with the tablet feels nearly identical to drawing on an iPad Pro display. 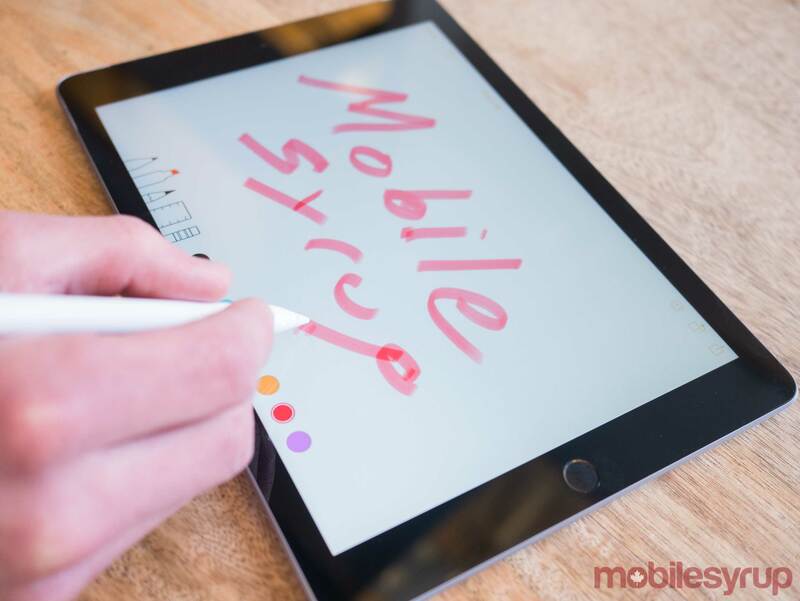 This includes in apps like iWorks — Pages, Numbers and Keynote — which now all support the Apple Pencil, as well as Affinity Photo, Adobe CC and even Evernote. That said, as some predicted, there is a visible air gap between the glass and the actual display with the 9.7-inch iPad. Those who haven’t taken an iPad Pro for a spin won’t notice this change, but given that I use the 10.5-inch Pro daily as my main tablet at home, the space between the display’s glass and the actual pixels was immediately apparent to me. With the iPad, it never feels quite like I’m writing on the actual display; the millimetre wide air gap removes the physical feeling that’s present when drawing or writing with the Apple Pencil on the iPad Pro. Still, apart from this minor gripe, using the Apple Pencil with the iPad is an overall great experience. As expected though, display quality, including colour vibrance, doesn’t compare to the iPad Pro. The 2018 iPad’s glass is also extremely reflective, making me wonder why Apple hasn’t opted for a more matte glass finish, though this could also make the display more difficult to see. I also find it strange Apple included Pencil support rather than a magnetic Smart Connector Keyboard port. Smart Keyboard compatibility would be generally more useful than a stylus from an education perspective, though this depends on what subject you’re studying, of course. That said, the 2018 iPad is compatible with Bluetooth keyboards and Logitech is even releasing a specific case that features a magnetic keyboard attachment. Still, Bluetooth keyboards are often a pain to connect and aren’t as convenient as Apple’s Smart Keyboard. The lack of a magnet accessory connecting port is baffling and was likely only made to differentiate the regular iPad from the Pro line. From a product marketing standpoint the decision makes sense, but that’s not something consumers care about. In a way, it may have made more sense for Apple to first release the inevitable new version of the Pro that features the iPhone X’s Face ID and minimized bezels, in order to give consumers a reason to buy its more expensive iPad. With this strategy, adding the magnetic Smart KeyBoard Connector to the lower-end iPad could have been a viable option. The new iPad includes two main features over last year’s offering: support for the $129 Apple Pencil and a new, more powerful processor, Apple’s A10 ‘Fusion’ chip. 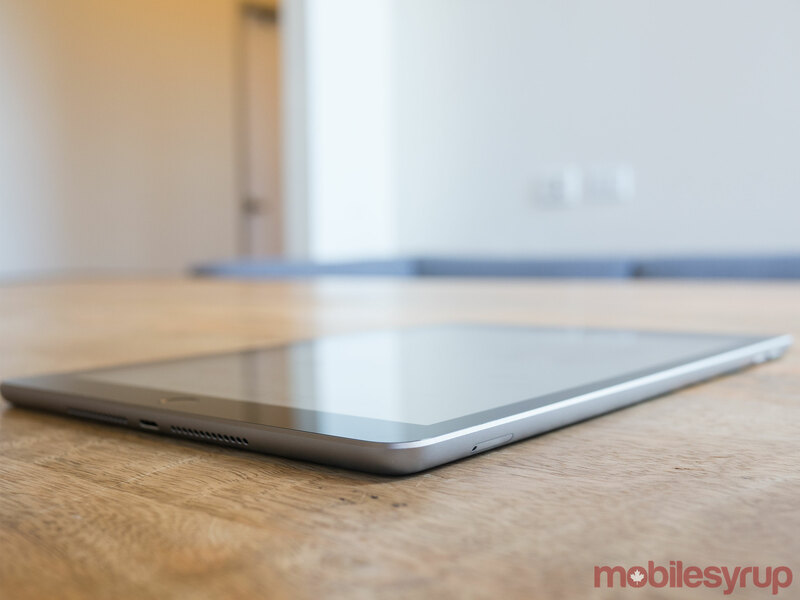 Everything about the tablet beyond these two changes — and yes, I really do mean everything — is identical to last year’s model, right down to display resolution, camera specs and the iPad’s first-generation Touch ID sensor. This means that the camera still measures in at the same serviceable 8-megapixels for the 1080p rear camera and the tiny 1.2-megapixel 720p front-facing shooter, along with just two speakers, compared to the four speakers the Pro features. That said the jump to A10 processor does result in some apps running marginally smoother and launching more quickly, when compared to last year’s A9. I spent a brief amount of time playing battle royale shooter Fortnite on the iPad and was impressed with how solidly the game ran. The iPad’s display also doesn’t feature True Tone ambient light matching and lacks the faster 120Hz refresh rate of the significantly more expensive Pro. Again, both of these features likely won’t be missed by many, especially given the 2018 iPad’s lower price tag. I’ve grown fond of them over the last few months, but neither are worth the extra $400 the 10.5-inch iPad Pro costs in the Canada. It’s also worth noting that the iPad can’t run three apps at once like the powerful Pro is capable of. If you open a third app in a slide-over window, with two apps split-screened, the background application automatically pauses. This isn’t the case with the latest iPad Pro, which was updated with multi-tasking functionality following the release of iOS 11. Apple likely curbed multi-tasking on the 2018 iPad because it only features 2GB of RAM instead of the Pro’s more sizable 4GB. Again, like many of the 2018 iPad’s shortcomings, this problem won’t be on the average iPad user’s radar, but it is an issue I encountered a few times when jumping between multiple apps. Update 04/06/2018: The review has been updated with additional comment from Apple regarding Canadian schools currently using iPads in the classroom. The new 2018 iPad is a very good tablet, especially for the under $500 price range. There's just very little competition at this price point, with Samsung's high-end Android tablets being significant more expensive. 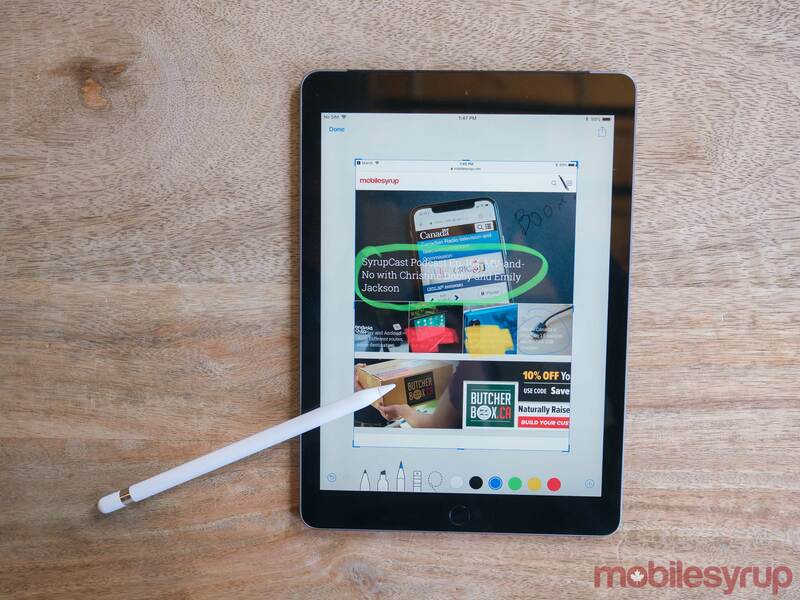 Whether or not the 2018 iPad is a worthwhile purchase for you depends on what iPad you're using right now as well as your interest in the tablet's added Apple Pencil support. If your current iPad is beginning to show signs up slow-down when running resource intensive apps, or is damaged -- maybe you're still rocking an original iPad Air, or an aging iPad Mini 4nd Gen -- then this more reasonably priced version of Apple's tablet could be a worthwhile upgrade for you. After all, $869 for the 10.5-inch iPad Pro is a steep asking price for a tablet that likely won't end up being your main computing device. However, if you're still rocking a first-gen Pro, or even last year's entry level iPad, then the 2018 version doesn't offer enough of an upgrade to warrant a purchase. The new Apple’s new 9.7-inch iPad starts at $429 CAD for the 32GB version and $549 for the 128GB iteration. A cellular version is available starting at $599, with the 128GB model coming in at $719. "Whether or not the 2018 iPad is a worthwhile purchase for you depends on what iPad you're using right now"